There is a growing concern regarding the ingredients that food industries are sneaking inside our favorite products. Some are easy to discern as "bad" such as high fructose corn syrup and MSG. Others are cloaked in fancy wording, making it harder to decipher. We may even read the labels in health food store items since they can't always be trusted. You would hate to feed your family tainted, adulterated goods! Their health is at stake and we know how important it is to properly feed our bodies. 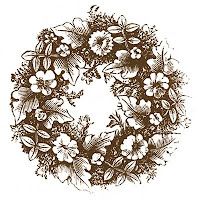 This post may be shared with some or all of the following link-ups: The Art of Home-Making Mondays, Modest Mom Monday's, Homestead Barn Hop, Amaze Me Monday, Monday's Musings, Marriage Monday, Titus 2sdays, Titus 2 Tuesdays, Tuesdays with a Twist, Raising Homemakers, Make Bake Create, Wise Woman Link Up, Wow Us Wednesdays, Wildcrafting Wednesday, The Scoop, Coffee and Conversation, So Much at Home, Homemaking Thursdays, Home Sweet Home, Hearts for Home Thursdays, Growing in Grace Thursdays, Home Acre Hop, From the Farm Blog Hop, Farmgirl Friday, Front Porch Friday Blog Hop, Simple Meals Friday, Foodie Fridays, Cultivate Nourishing, Simply Natural Saturdays and Clever Chicks Blog Hop. Thank you lovely ladies for hosting these. Fourth to fifth grade (even sixth grade) is an excellent time to begin this project. However, you can adapt it to fit the different needs and stages of your family. 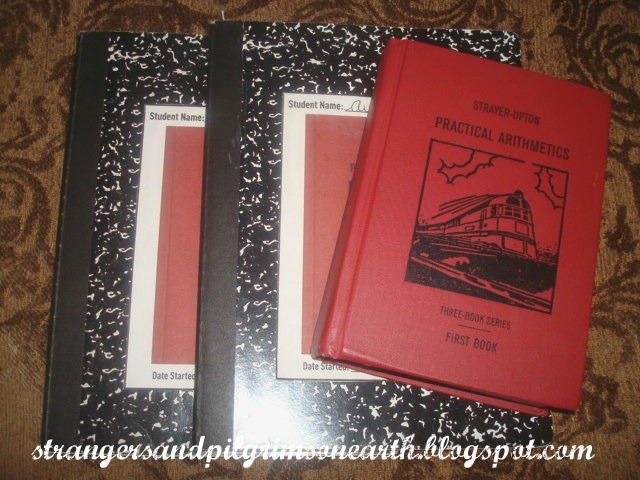 Though you commence this study primarily for your older student(s), younger children may be just as involved while not necessarily instructed to keep a notebook themselves (This way you aren't doing a thousand things at once in your homeschool which would be a burden!). They can still partake in many age appropriate activities though perhaps at a different level. For example, while an older student is preparing a report on Ancient Egypt, your younger scholars could be drawing pyramids, recreating maps of Egypt and penning Egyptian related Bible verses for copywork (we will go into further lesson details/ideas in a future post). "If you are teaching children of several ages, it is perfectly all right to have all of them studying Columbus and the explorers at the same time. Or all can study Ancient Greece at the same time. Younger children can read easier books, help make posters or scrapbooks, or take part in skits. They can enter into discussions or sharing time where family members contribute information from their reading or, better yet, raise questions they would like to find answers for." Another way to keep younger children occupied, is to print off their very own timeline (if they express an interest) and allow them to enjoy this project in their own special way (You may be surprised at what they come up!). When they reach the appropriate age, they can jump in and begin their own "proper" timeline/notebook projects. 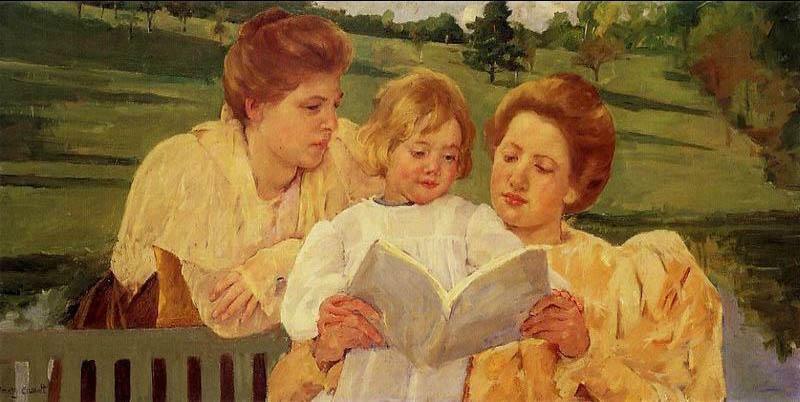 Some mothers restart a world history study every four years and change/adapt the reading books, etc. 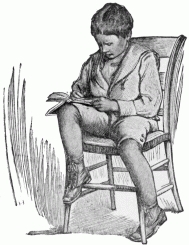 as their child ages and the younger children mature into reading the previously read literature. Note: In the younger years, prior to starting this project (and before we had an older student), we did a lot of Bible/character building, science/nature studies, geography activities, and learned about American History so that the basic relationships of things "currently" surrounding our child was already established. Technically, never. Once started, your children will continue to record and add information to their timelines as they learn for the rest of their homeschooling journey! This project will grow as your student does, will become an educational keepsake and will possible give birth to a life-long hobby! 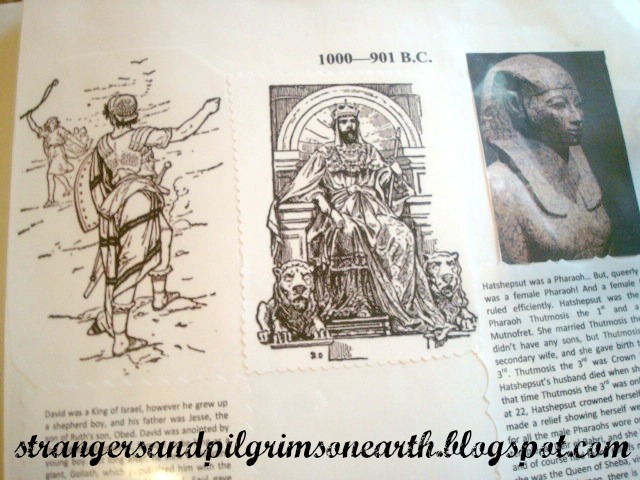 Does this concept of teaching world history interest you? It is never too late to mend but we may not delay to offer such a liberal and generous diet of History to every child in the country as shall give weight to his decisions, consideration to his actions and stability to his conduct. 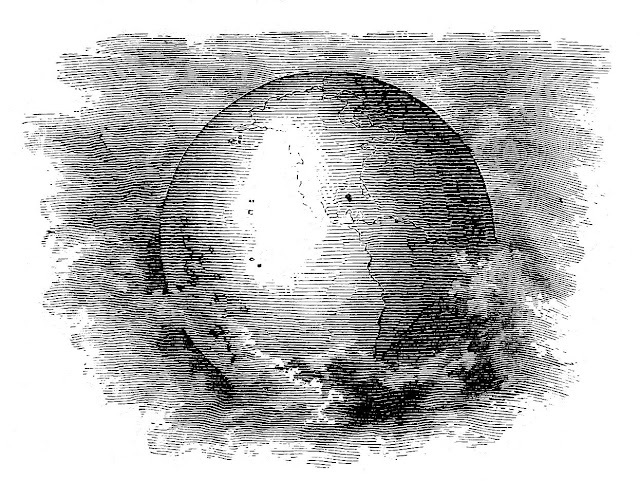 ; that stability, the lack of which has plunged us into many a stormy sea of unrest." 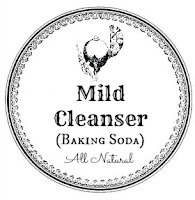 Another easy way to save money and remove chemicals from your home is to simply substitute baking soda (purchased in bulk) for store bought cleanser. It is quite the effective alternative! To make a scented version, add 10-15 drops of your favorite essential oils to every cup of baking soda. 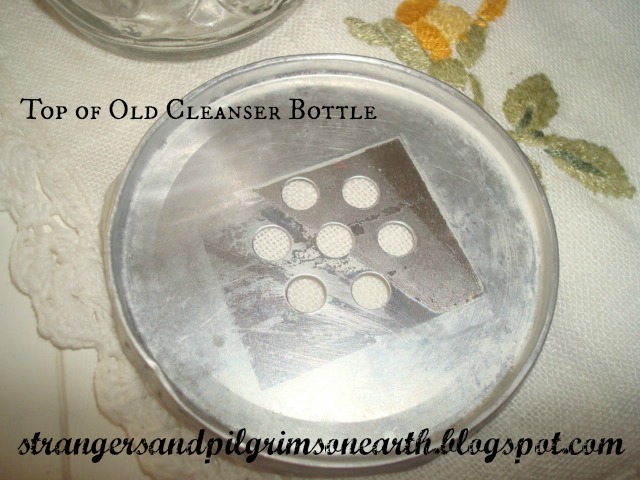 To create your "cleanser jar", remove the "top part" (shown above) from your old cleanser bottle. 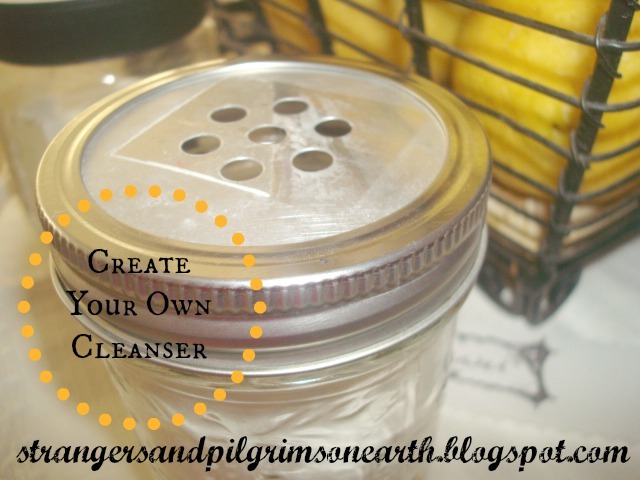 Then, using your canning lid for a template, trace out the proper jar lid size (i.e., wide or regular mouth) onto your salvaged cleanser piece. Simply snip to size. It cuts fairly easy with heavy-duty scissors. 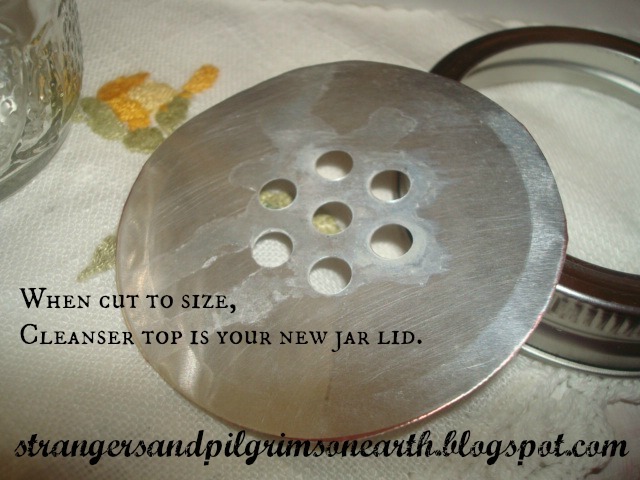 Insert the custom cut part inside the screw band and screw on your canning jar. You may want to glue this insert piece all along the inside rim of the band to keep the contents from leaking out through the sides when you use the cleanser. 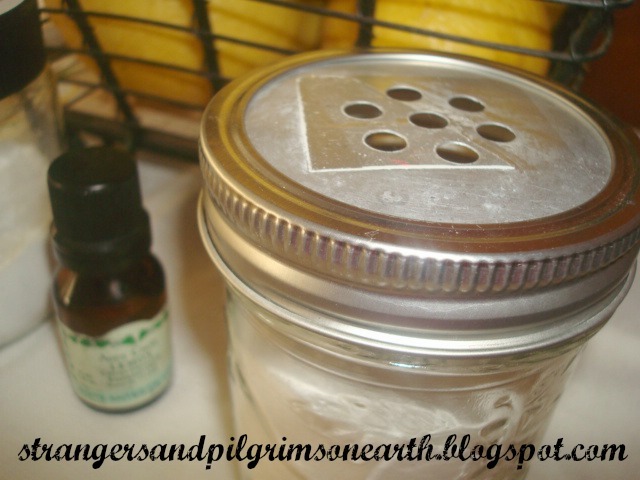 Finally, add one cup of baking soda and stir in your essential oil drops if you choose to use them. 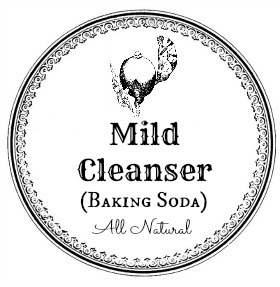 If you require a stronger scouring cleaner, mix together 1/4 cup of borax, 1/4 cup of salt and 1/4 cup of baking soda. Place inside your jar. This will give you good scrubbing power while still maintaining your budget and health. Should you have young ones that will be using this and a glass jar seems scary, a recycled spice shaker like this one works out well too. 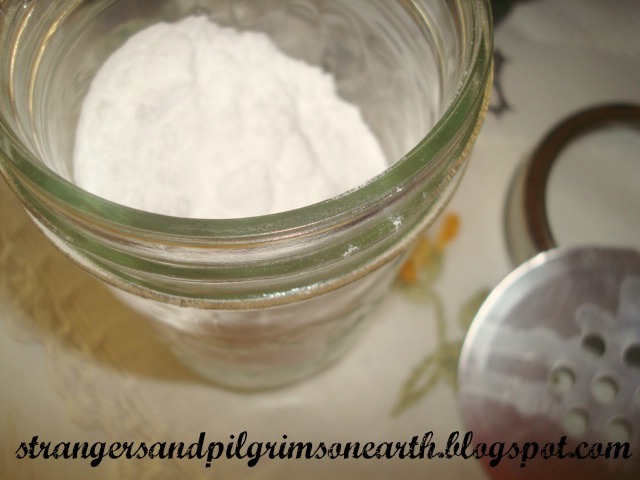 For other thrifty, cleaning product projects, visit here for our collection of past posts. 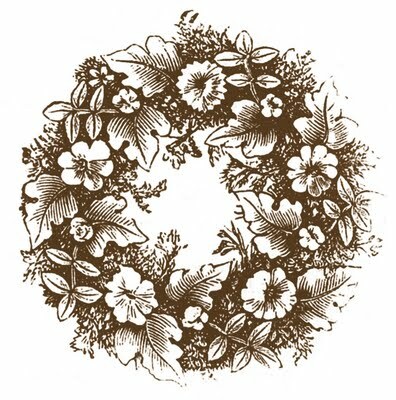 "We must always remember that it is a great merit in housekeeping to manage a little well... To live well in abundance is the praise of the estate, not of the person. I will study more how to give a good account of my little, than how to make it more." In this there is true wisdom, and it may be added, that those who can manage a little well, are most likely to succeed in their management of larger matters. Economy and frugality must never, however, be allowed to degenerate into parsimony and meanness." 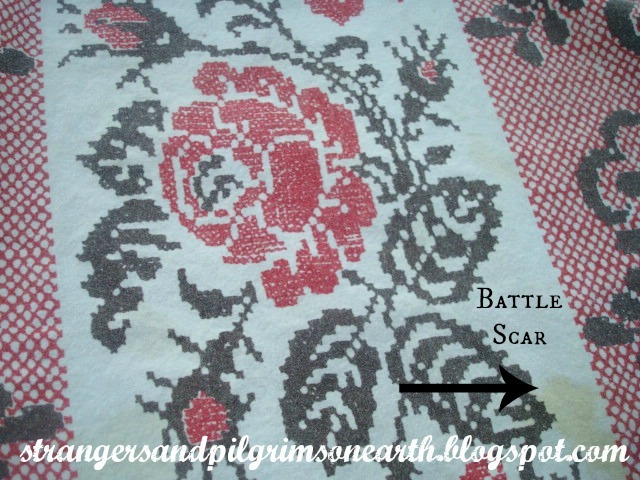 This post may be shared with some or all of the following link-ups: The Art of Home-Making Mondays, Modest Mom Monday's, Homestead Barn Hop, Amaze Me Monday, Monday's Musings, Marriage Monday, Titus 2sdays, Titus 2 Tuesdays, Raising Homemakers, Make Bake Create, Wise Woman Link Up, Wow Us Wednesdays, Wildcrafting Wednesday, The Scoop, Coffee and Conversation, So Much at Home, Homemaking Thursdays, Home Sweet Home, Hearts for Home Thursdays, Growing in Grace Thursdays, Home Acre Hop, From the Farm Blog Hop, Farmgirl Friday, Front Porch Friday Blog Hop, Simple Meals Friday, Cultivate Nourishing and Clever Chicks Blog Hop. Thank you lovely ladies for hosting these. One of the most appealing concepts (for myself at least) regarding home education, was the idea that we could teach our children world history in the order in which it actually occurred. It sounds very obvious, yet how many of us who have gone through the public school system can boast the know-how of thinking chronologically? Was Cleopatra alive prior to or before the birth of Christ (Answer: A short while before)? 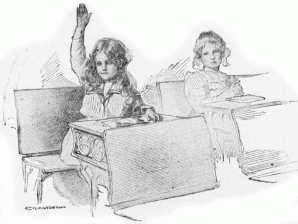 What was going on when Jane Austen was growing up in the English countryside (Answer: French Revolution)? To have your children understand the links of time and literally "show" them how everything unfolded since the beginning of creation appeared genius! Main Tool to Implement Teaching History in Chronological Order? "In order to give definiteness to what may soon become a pretty wide knowledge of history––mount a sheet of cartridge-paper and divide it into twenty columns, letting the first century of the Christian era come in the middle, and let each remaining column represent a century B.C. or A.D., as the case may be. Then let the child himself write, or print, as he is able, the names of the people he comes upon in due order, in their proper century. We need not trouble ourselves at present with more exact dates, but this simple table of the centuries will suggest a graphic panorama to the child's mind, and he will see events in their time-order." "For children, timelines are not for pulling together the scattered pieces of knowledge, as they do so well with adults; children haven't yet collected enough pieces to pull together. What timelines do for children is to provide a framework into which they can put pieces of knowledge as they learn them. For this framework purpose, timelines should be very simple-- so simple that children can memorize them." "These things children must have; but they come into the world with many relations waiting to be established; relations with places far and near, with the wide universe, with the past of history, with the the social economics of the present, with the earth they live on and all its delightful progeny of beast and bird, plant and tree; with the sweet human affinities they entered into at birth; with their own country and other countries, and, above all, with that most sublime of human relationships––their relation to God." but we'll get a lot of seed out of these for next year." 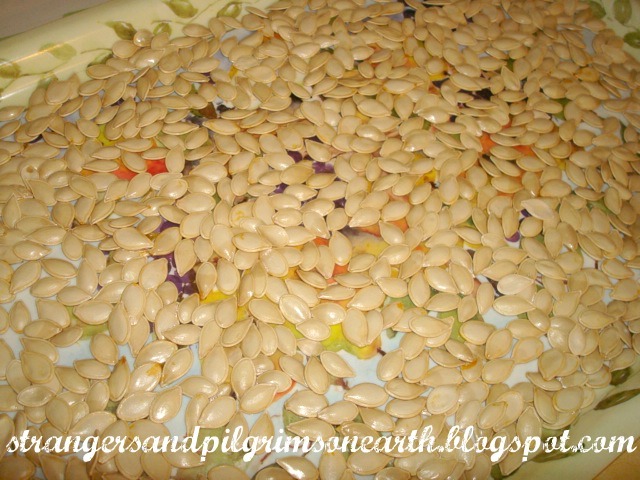 Simply place your seeds in a colander and rinse them with cool water to remove "orange stuff". 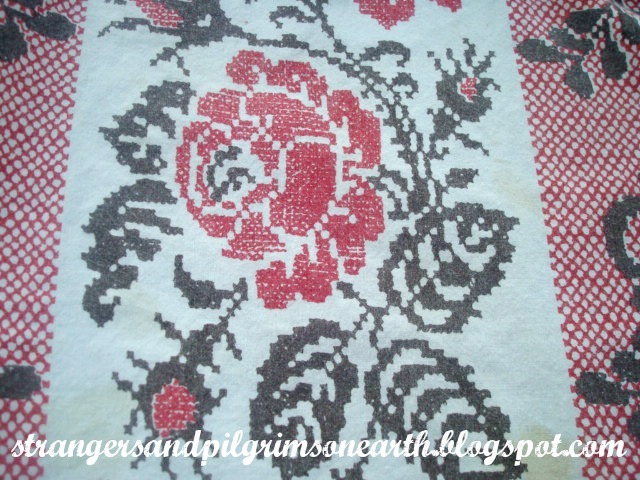 Lay your clean seeds out on a fresh towel and blot them dry. Next, place them on a tray and let them sit in a dry area for two weeks to finish drying out. You can store them in a cool, dark place or put them in the freezer if you live in a humid area. Roast your seeds for a tasty and frugal snack if you are unsure of your pumpkin source (i.e., if it is a re-plantable heirloom variety or not) or if you simply have excess seeds. Wash seeds as indicated in first two steps above. Toss seeds with combinations of your choice such as sea salt/olive oil, oil/cinnamon/sugar, or sea salt/olive oil/chili powder. Place the seasoned seeds on a cookie sheet in a single layer. Bake in 300 degree oven for 15 - 20 minutes (or until golden). You may want to stir them and flip them halfway though roasting. Store roasted seeds in a ziplock bag or airtight container. Place in fridge if you won't be consuming them within a week so they don't go rancid. 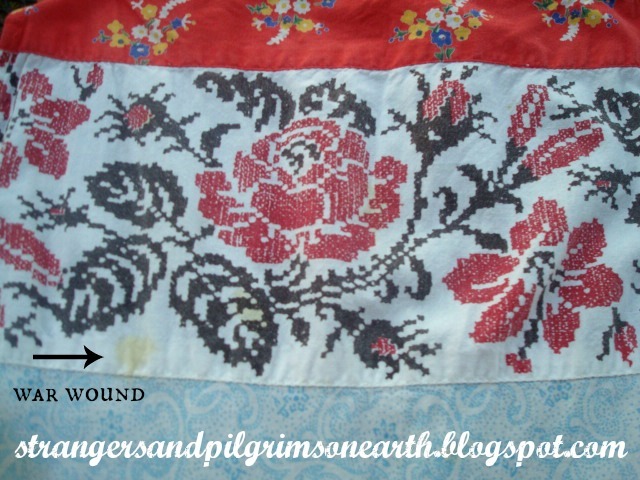 This post may be shared with some or all of the following link-ups: The Art of Home-Making Mondays, Modest Mom Monday's, Homestead Barn Hop, Amaze Me Monday, Monday's Musings, Marriage Monday, Titus 2sdays, Titus 2 Tuesdays, Tuesdays with a Twist, Raising Homemakers, Make Bake Create, Wise Woman Link Up, Wow Us Wednesdays, Wildcrafting Wednesday, The Scoop, Coffee and Conversation, So Much at Home, Homemaking Thursdays, Home Sweet Home, Hearts for Home Thursdays, Growing in Grace Thursdays, Home Acre Hop, From the Farm Blog Hop, Farmgirl Friday, Front Porch Friday Blog Hop, Simple Meals Friday, Foodie Fridays, Cultivate Nourishing, Simply Natural Saturdays, Clever Chicks Blog Hop and the Fall Linky Pumpkin Party. Thank you lovely ladies for hosting these. 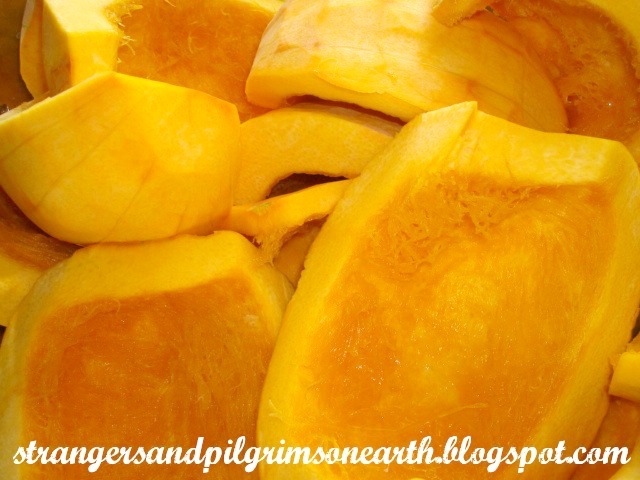 "… Pa brought six yellow-gold pumpkins from the field." We removed the outside peel, scooped out the seeds and flesh (save the seeds*). the skins will slip off once soft, *OOPS* sorry honey! Wash thoroughly. Cut into smaller chunks and place in steamer. Cover and steam until tender (about 20-30 minutes). They are finished when fork can easily poke through the pumpkin. 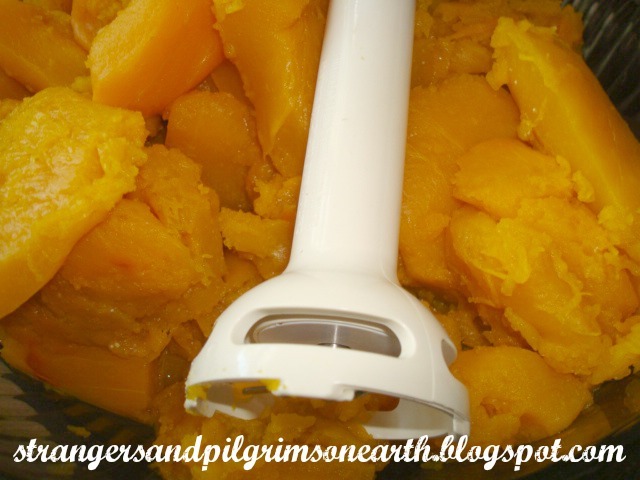 Dump contents into strainer to remove any excess water and then place into a large bowl. Let cool a few minutes and puree until smooth (I used a stick blender). You could probably mash this by hand with a manual masher if you had to. Let the pumpkin puree cool. store in the refrigerator and use within a week. 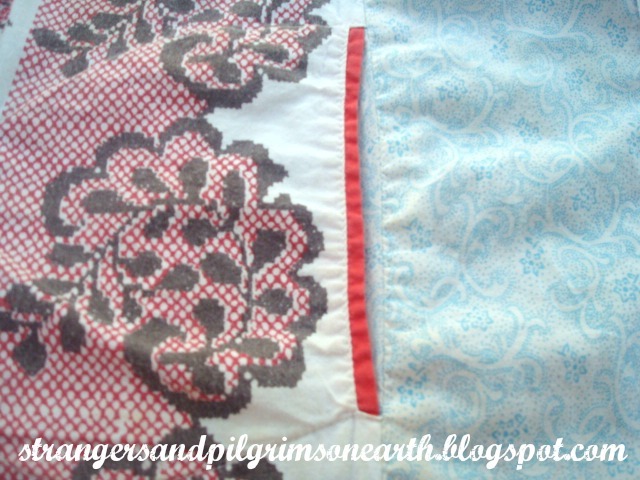 while I make the piecrust," said Ma." 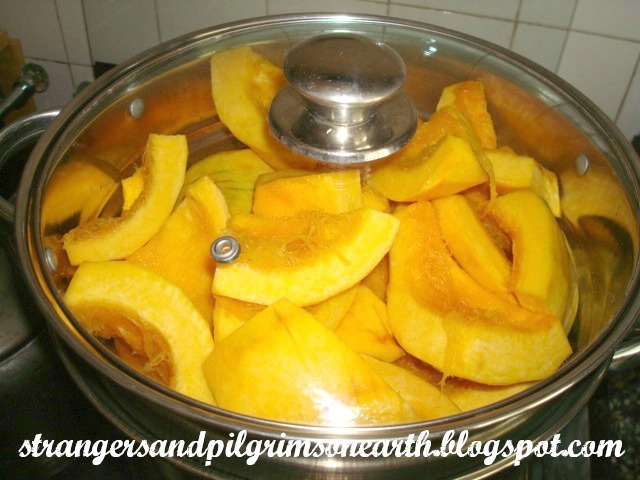 To use the frozen pumpkin in desserts, thaw in refrigerator 24 hours in advance. If you notice water on the surface, skim prior to using (though I didn't have that problem). Note: The "Libby's" 15 oz. can equates to approximately 1 ¾ cups of your pumpkin puree. 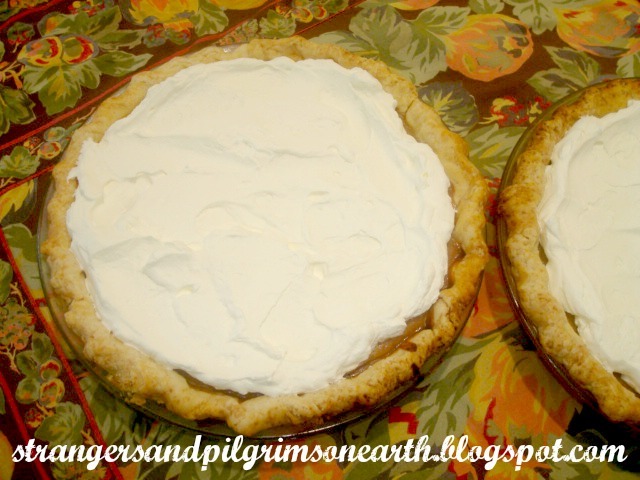 If you are interested, here is a super easy pie crust recipe which makes four at once. To make your pumpkin pie extra special, may I suggest that you top the whole surface with freshly whipped cream (you can do this up to a day in advance). Delicious! 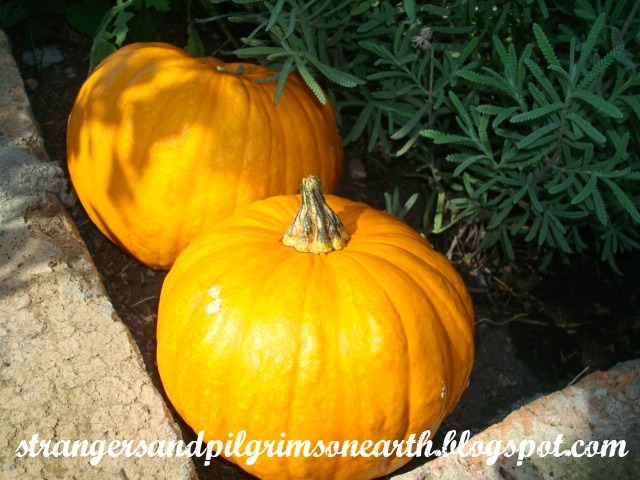 How do you prepare your pumpkins? Happy harvesting! "She girdeth her loins with strength…"
There are days when you wake up feeling less than ready to meet the challenges. Perhaps you have a headache, or you feel that "edge" coming on (you know which one I am referring to), maybe it's simply poor weather (too hot, too cold). Whatever the reason, you could feel it in your bones that the patience level is zero and yet the whole household is depending upon you to function properly! For moments like this, it helps to gear up in our God given armor! 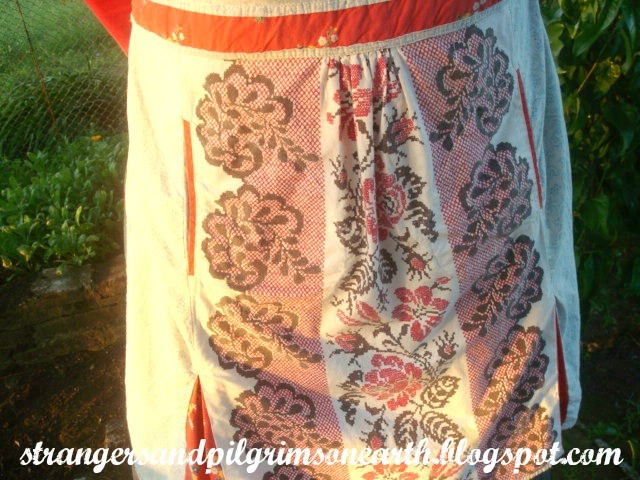 Like our Creator gave Israel many physical symbols regarding their garments as reminders of Him, I like to think that the apron for the "keeper at home" can be used as a similar tool. 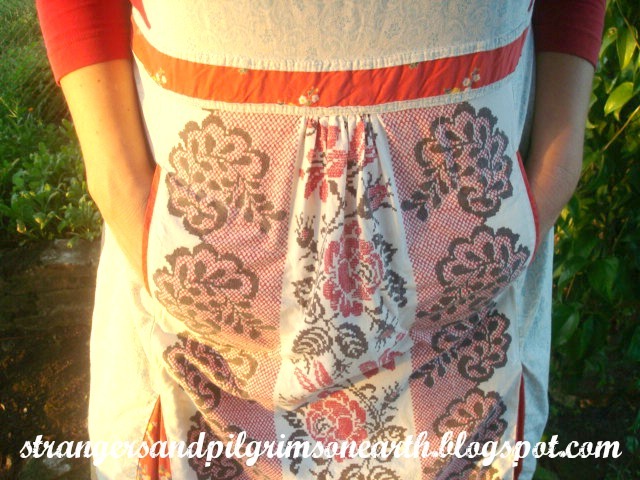 When we tie the apron-strings around our waists, we are "girding our loins" with "truth". and having on the breastplate of righteousness…"
The "truth" is that we work for and represent the King of Kings as we fulfill our Titus 2 roles. The "strength" spoken of in Proverbs 31:17 is the heavenly help from our Creator. Our apron can be a reminder that we are serving Him and in whatever we do, we are to do it with all our heart (Colossians 3:23). There is a daily battle but we are well equipped! Our weaponry is simply the power of prayer. As the keeper at home, this is one of our greatest defenses. There may be scars (or in our case, "stains") but with help from the Almighty, we "can do all things" (Philippians 4:13)! "Finally, my brethren, be strong in the Lord, and in the power of his might." Next time you feel the day spiralling out of control, put on your *apron armor* and let it remind you that we are His ambassadors. We are not alone and though today may be tough, the future with God is always promising! thoughts of peace, and not of evil, to give you an expected end." and she shall rejoice in time to come…"
This post may be shared with some or all of the following link-ups: The Art of Home-Making Mondays, Modest Mom Monday's, Homestead Barn Hop, Monday's Musings, Marriage Monday, Titus 2sdays, Titus 2 Tuesdays, Raising Homemakers, Make Bake Create, Wise Woman Link Up, Wow Us Wednesdays, Wildcrafting Wednesday, The Scoop, So Much at Home, Homemaking Thursdays, Home Sweet Home, Hearts for Home Thursdays, Growing in Grace Thursdays, Home Acre Hop, From the Farm Blog Hop, Farmgirl Friday, Front Porch Friday Blog Hop, Simple Meals Friday, Cultivate Nourishing and Clever Chicks Blog Hop. Thank you lovely ladies for hosting these. 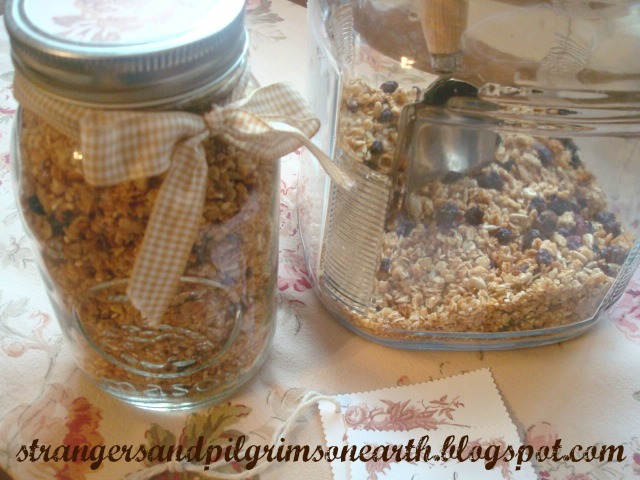 Granola ~ Good Breakfast and/or Great Gift! 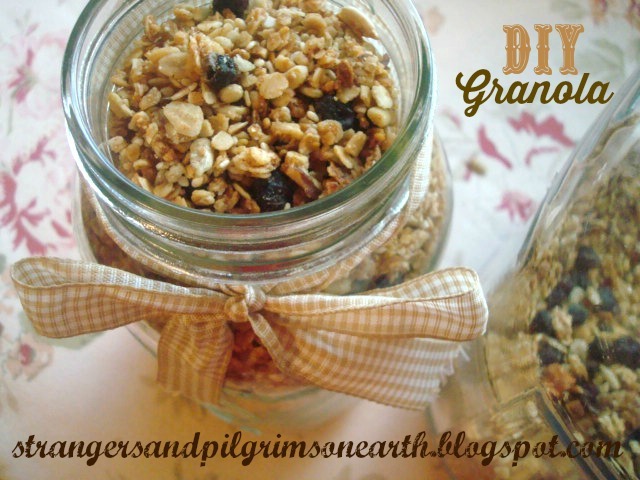 We love granola in our home but let's face it, each box is so expensive! 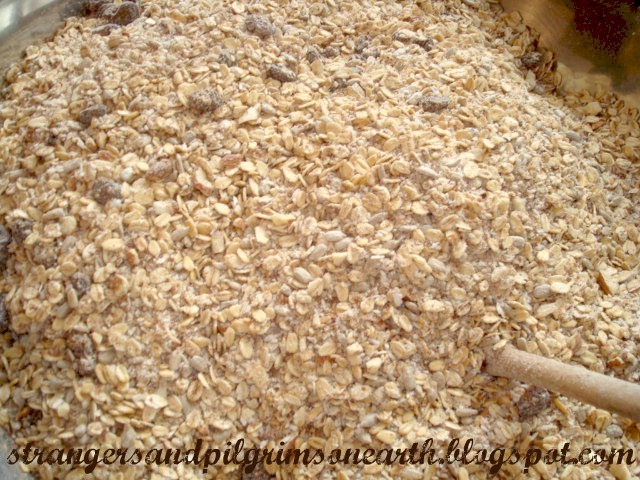 The good news is, if you buy the oats in bulk, you are able to make up a tasty batch and save yourself lots of dollars. It is very easy to prepare! 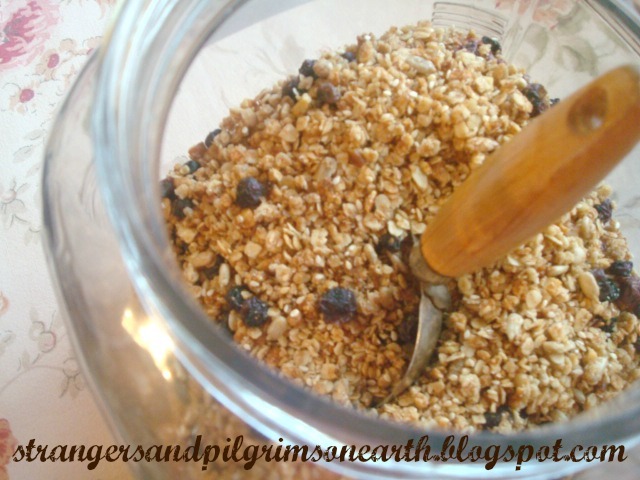 We like to eat ours like a cereal or sprinkle on top of yogurt for a quick and healthy breakfast. Combine the following ingredients together in a sauce pan. I use raw honey which hurts my heart to bring to a boil (since it kills all the good enzymes) so I place this on the lowest heat possible and stir until everything is melted together. If you aren't using raw honey, go ahead and cook on medium heat until sauce begins to boil and then remove from heat. Pour sauce into the dry ingredients. Mix all the goodness together until everything is evenly coated. 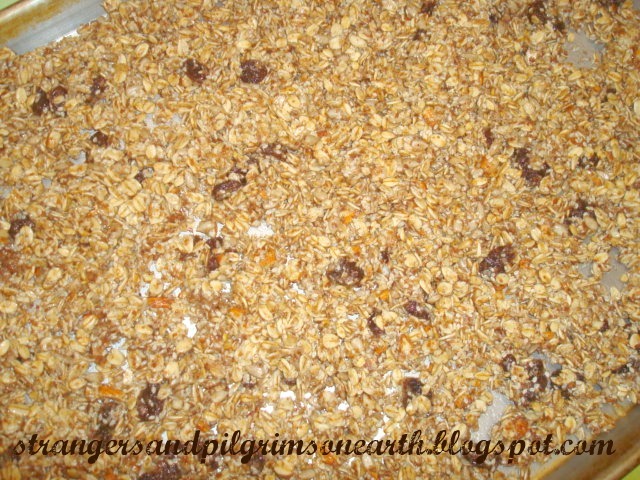 Place on cookie sheets (single layer) and bake in batches (275 degrees) according to how much you want to have on hand. It usually takes about thirty minutes and needs to be stirred twice (about 10 and 20 minutes into your baking). 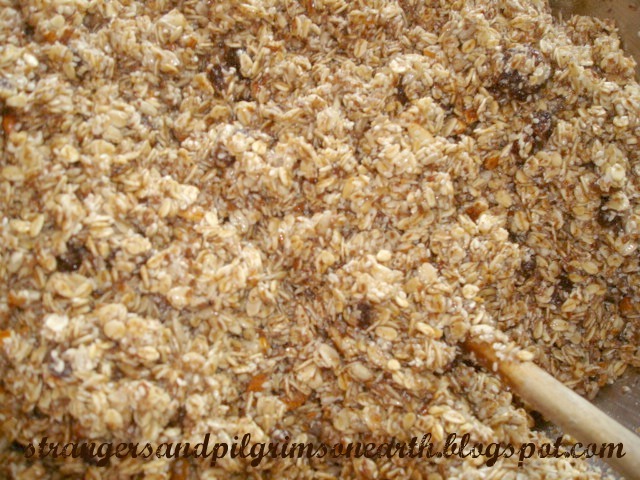 When granola starts to turn golden you are finished. Let the finished product sit on rack until completely cooled and then place in airtight container. Note: This is also a great time to mix in some chia seeds for some extra nutrition (for a rich source of Omega-3 fatty acids, protein, antioxidants and fiber). I add this ingredient after in order to keep them raw. This recipe was adapted slightly by one featured in Fix Freeze Feast (One of my favorite cookbooks!). 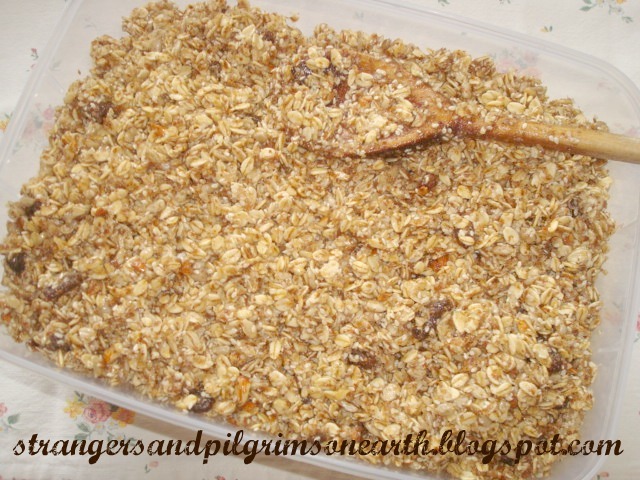 You may also freeze the remainder of your unbaked granola. 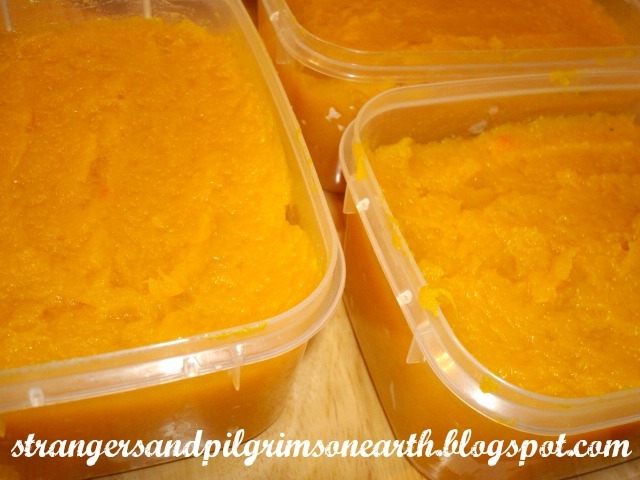 We go through this quickly so I prepare half of the batch at one time and freeze the other half in a plastic container until we are ready for it. Then you simply thaw out and bake as directed above. Your extra granola also makes a lovely gift when placed in decorative packaging. Earth tone embellishments give it that fall feel. 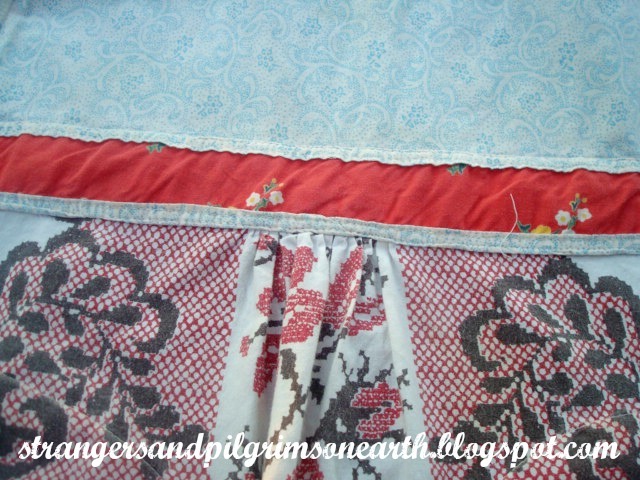 We inserted a piece of pretty paper (the brown wreath at the bottom of this post would be nice too) in between the jar lid and screw band and attached a gingham bow. 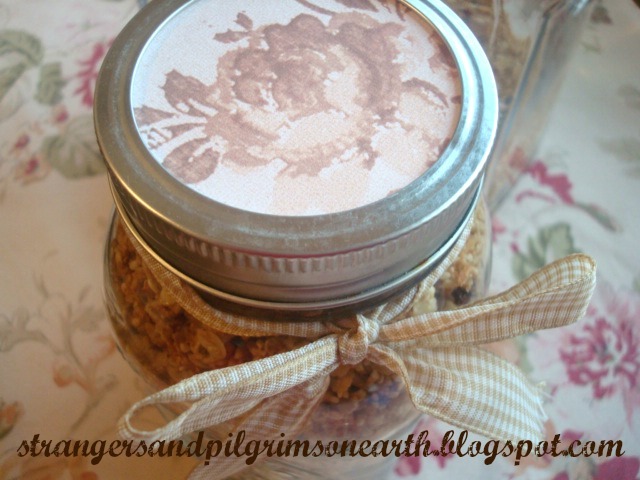 There are so many darling possibilities when it comes to dolling up mason jars! 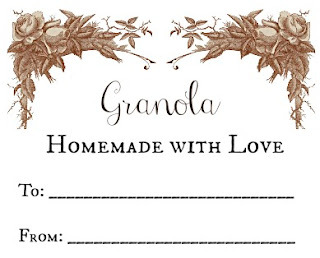 Think hostess gift, get well gift, cheer up gift, just had a baby gift or a simple, thinking of you… Attach a gift tag to the jar with a piece of twine to finish it off. You are welcome to use my gift tag label. Just right click on the image and save. "Breakfast: Come to breakfast!Little ones and all,—How their merry footstepsPatter at the call!Break the bread; pour freelyMilk that cream-like flows;A blessing on their appetitesAnd on their lips of rose. Dinner may be pleasantSo may the social tea,But yet, methinks the breakfastIs best of all the three.With its greeting smile of welcome,Its holy voice of prayer,It forgeth heavenly armorTo foil the hosts of care." 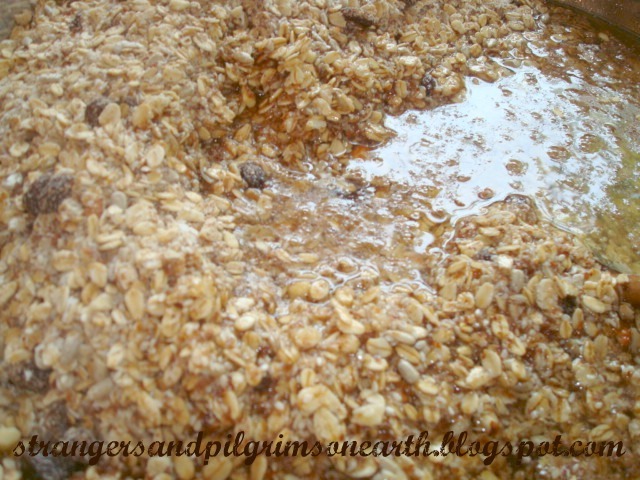 This post may be shared with some or all of the following link-ups: The Art of Home-Making Mondays, Modest Mom Monday's, Homestead Barn Hop, Amaze Me Monday, Monday's Musings, Marriage Monday, Titus 2sdays, Titus 2 Tuesdays, Tuesdays with a Twist, Raising Homemakers, Make Bake Create, Wise Woman Link Up, Wow Us Wednesdays, Wildcrafting Wednesday, The Scoop, Coffee and Conversation, So Much at Home, Homemaking Thursdays, Home Sweet Home, Hearts for Home Thursdays, Growing in Grace Thursdays, Home Acre Hop, From the Farm Blog Hop, Farmgirl Friday, Front Porch Friday Blog Hop, Simple Meals Friday, Foodie Fridays, Cultivate Nourishing, Simply Natural Saturdays and Clever Chicks Blog Hop. Thank you lovely ladies for hosting these. 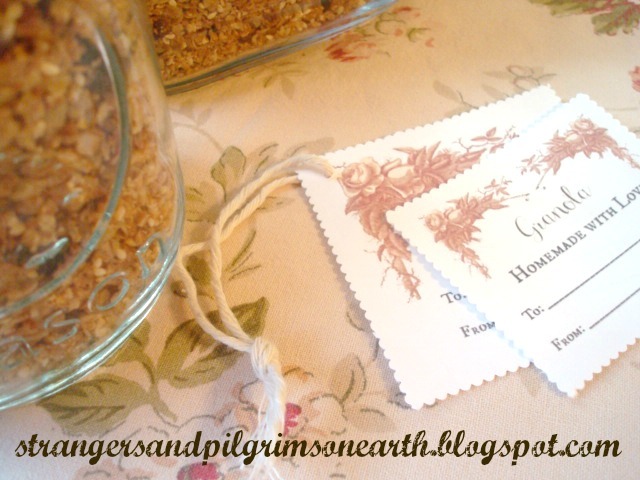 Granola label/gift tag graphic courtesy of Reading, Roses and Prose. 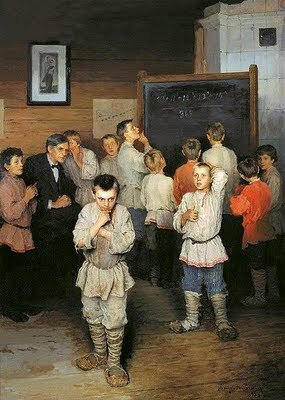 as a means of education than that of arithmetic." to take the taste out." The time has finally come to discuss math (sigh). We are definately a reading family. Literature is our first love. 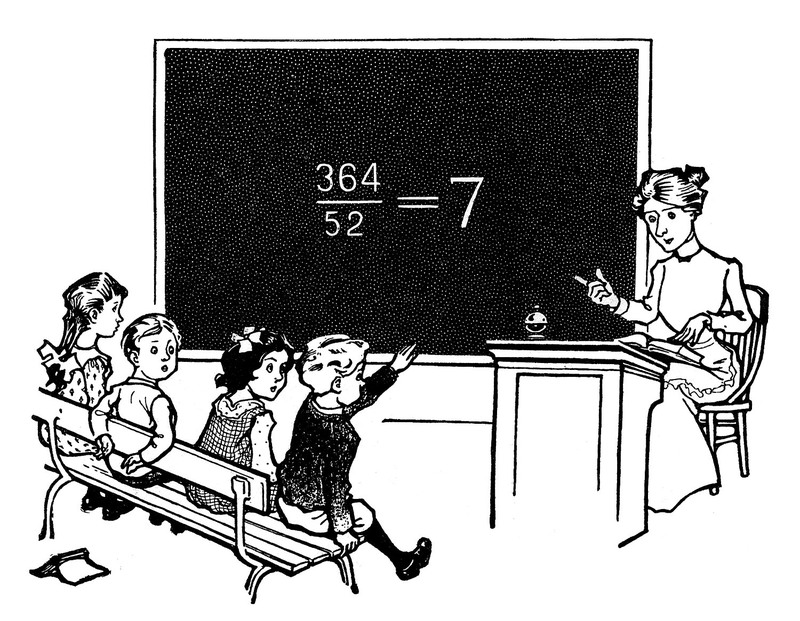 Math is… well… just there to hinder all the fun of homeschooling (just kidding, well not all the way...). We wanted something thorough but with a "get in and get out" format. Finally the solution for our homeschool presented itself. It's called the Practical Arithmetic Series and here is how we implement it utilizing some of Charlotte Mason's ideas. For the record, I am not claiming this is the best or only way to go, but simply how we do math in case any one else is struggling and needs ideas. The title says it all, "practical". 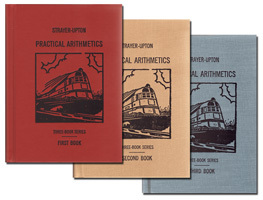 They offer three, hardcover, vintage style volumes (reprinted from the 1930's) in the series which will take your student from basic math addition/subtraction (third grade-ish) to pre-algebra (eighth grade). They are also working on printing the fourth volume which will take students to higher levels. A few pages a day will keep your child learning on track. I did notice that there are times when they give way too many problems of the same sort (busy work) and I usually slice that in half, if not more. One of the Charlotte Mason concepts I gleaned was to not beat a dead horse on a certain subject. If the child understands the concept then move on. Don't dull their desire to learn with mounds of busy work. Fifteen to twenty minutes of math a day is sufficient. What really pleased me was the fact that this curriculum is full of word problems. When explaining our purchase with a cousin who teaches math in high school, she said that the key to any math curriculum was story problems. She shared that although the math concepts are being taught in the schools, children have lost the skills of how to apply them which defeats the whole purpose of arithmetic! Word problems are a necessary tool used to implement the application of math in the real world. "Demonstrate. --The next point is to demonstrate everything demonstrable. 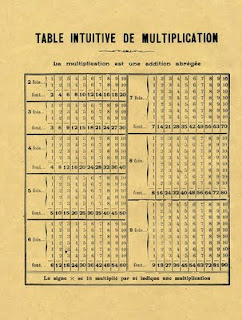 The child may learn the multiplication-table and do a subtraction sum without any insight into the rationale of either. 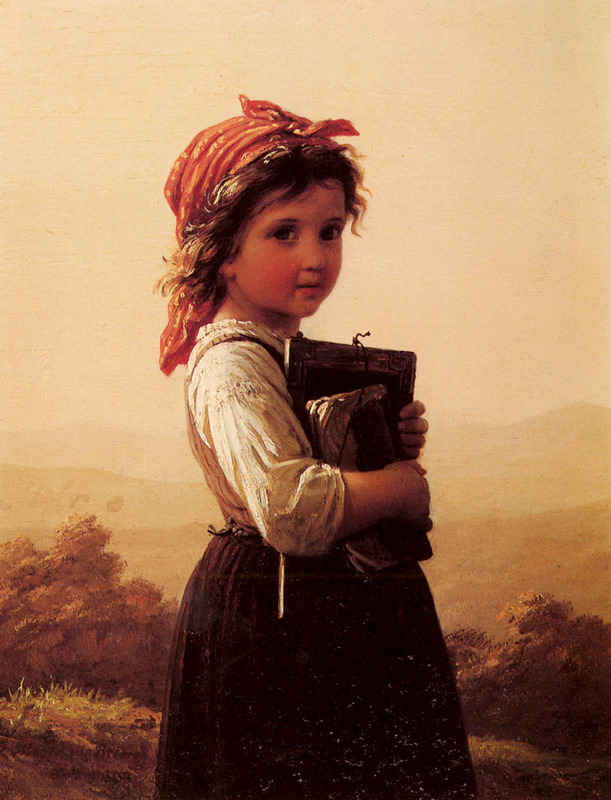 He may even become a good arithmetician, applying rules aptly, without seeing the reason of them; but arithmetic becomes an elementary mathematical training only in so far as the reason why of every process is clear to the child." Introducing Math Concepts with "Living Math"
To supplement the dryness of the textbook, we usually introduce the main math concepts as they appear in the curriculum with math games, math learning songs and/or hands-on instruction whenever possible. When teaching fractions, we utilized the kitchen as a schoolroom with baking and cooking. When teaching multiplication, we used beans as manipulatives to present the idea and then let them loose on the corresponding math problems once all is understood. Our arithmetic curriculum just reinforces what we have learned in practical demonstration (when applicable). I will share some of these resources and ideas in a future post. "He has a bag of beans; places four rows with seven beans in a row; adds the rows thus: 7 and 7 are 14, and 7 are 21, and 7 are 28; how many sevens in 28? 4. Therefore it is right to say 4x7=28; and the child sees that multiplication is only a short way of doing addition. 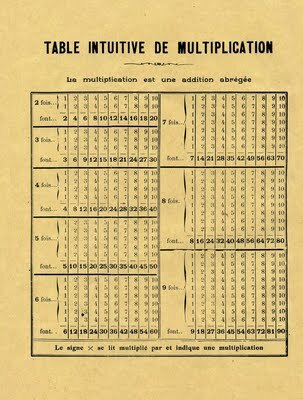 A bag of beans, counters, or buttons should be used in all the early arithmetic lessons, and the child should be able to work with these freely, and even to add, subtract, multiply, and divide mentally, without the aid of buttons or beans, before he is set to 'do sums' on his slate." I am not affiliated with this math company in any way. I just like the price straightforwardness of it. Second, I am by no means saying this is for everyone since it is so basic. There are wonderful math sets out there that teach in fun, hands-on ways with some of them being done for you on the computer. What I will suggest is that a regimented math curriculum is a must (reasons are shared here). I hope this helps some of you out there. Don't feel guilty if a certain subject isn't your forte, just do your best and purchase a curriculum that fits your needs! Rainbow Resources provides further information about this curriculum here if you are interested. 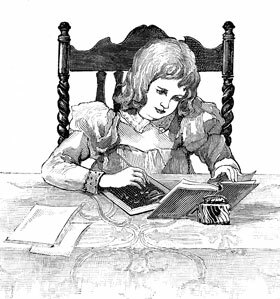 "Carefully graduated teaching and daily mental effort on the child's part at this early stage may be the means of developing real mathematical power, and will certainly promote the habits of concentration and effort of mind."